A lightweight, compact scale thatâ€™s self-contained in a high-impact, plastic case. The weighing tray telescopes to weigh infants lying down, seated or standing. Weight is displayed on a digital readout in pounds or kilos. 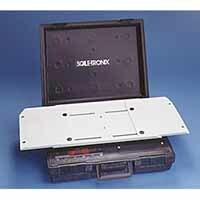 Features include â€œAutomatic Holdâ€� which displays weight after the patient is removed from the scale. â€œRecallâ€� retrieves weight stored in memory. â€œReweighâ€� repeats weighing without removing the patient and re-zeroing the scale. Capacity - 45 lb-20 kg. Accuracy - 2/10 oz-10 gm. Low Battery Indicator -Â Indicates battery needs replacing. Weighing Tray - 10" X 24". Carrying Case - 15" X 19" X 5".